With high quality products, professional installers, and time-efficient bathroom transformations, Five Star Bath Solutions strives to make your next bathroom renovation project simple and easy for you! From low-maintenance bathroom solutions to one-day bath transformations, our company is committed to providing professional bathroom renovations with Five Star customer service. Our values are focused on delivering the highest quality bathroom renovation service in the industry. Recognition: Nationally recognized. Locally owned. 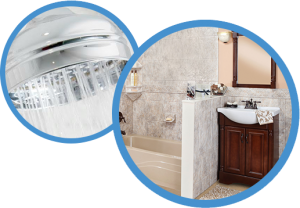 Choose from a variety of bathroom product lines, including Delta, Moen, Luxury Bath, Sentrel Bath Systems, and others. From partial to full renovations, Five Star Bath Solutions provides services for a range of bathroom renovations. Our catalog features various colors, selections, and styles for your next bathroom remodeling project. efficiency. Depending on project size and scope, Five Star Bath Solutions strives to complete all bathroom renovation projects in a timely manner with emphasis placed on 1-day bathroom installation options. Many of our bath and shower systems are equipped with antimicrobial protection. Resistant to mold and mildew, your new bath or shower will be easier to maintain and clean. From the moment you request an estimate until completion of a bathroom renovation project, Five Star Bath Solutions strives to respect your time. Five Star Bath Solutions installers are insured and come fully equipped with the tools they need to update your bathroom space. Pure Solutions, the charitable arm of Five Star Bath Solutions is focused on “giving the gift of hope” to individuals in need.